Sony’s A/V receivers have always been good, but they haven’t always managed to stand out against competition from the likes of Marantz, Onkyo, and Denon. With the STR-DN1060, and its subsequent iterations, they intended to change that. But did they succeed? In this review, we break down the STR-DN1060’s sound, design, packaging and accessories, specs and more. To see alternatives, read our list of the best A/V receivers. The Sony STR-DN1060 was actually released in 2016, and has had several new versions released since, including the excellent DN1080. We first reviewed it at the time of its release, and what you’re reading now is an updated review, with a little bit more analysis in detail, as well as a discussion of receivers that have been released since then. You can read more about them below. To test the sound, we used the Pioneer SP-PK22BS Andrew Jones 5.1 Speaker Package (full review here), a reasonably basic workhorse of a surround sound system, with a subwoofer, four bookshelf speakers, and a center channel. We’re familiar with the noise it makes, so we were confident of being able to analyse the sound of the receiver. Many surround systems demand extensive time calibrating them, or an audiophile’s knowledge of speaker placement and composition. Not the DN1060. The system includes a microphone at the end of a very long, very thin cable. You place it in your listening position (we found stacking it on a few cushions on the couch helped a bit), select your speaker setup using an easy on-screen graphic, and tell it to calibrate. Less than a minute of strange noises later, and the sound will be optimised for your room. We tested the system before and after calibration, and there was a real difference. Beforehand, our bass was muffled, and the mids felt worryingly harsh. Afterwards? It was like putting on a pair of glasses and having the view snap into focus. Dialogue in the movies and games and series we tested was crisp and clear. Explosions and punches had real weight. More importantly, the system communicates a genuine sense of dimension and space, doing it far more effectively than we’d expect for a receiver in this price range. Dynamics were excellent, too. Most models these days will produce at least competent surround sound, but the DN1060 genuinely impressed us. It matches up well with other receivers in the sub-$1,000 price range; compared to the $780 Onkyo TX-RZ820, the $550 DN1060 performs incredibly well. The former receiver will give you more features and more power, but sound quality-wise, there’s very little to differentiate the two. That’s not saying it could use some improvement. We had to calibrate the volume and frequency crossover of our subwoofer after setup (here’s an explanation of what that means), as we found the low-end was still getting a little bit lost. Once we fixed it, it was direct enough, but seemed to lack a little bit of power. We also weren’t wild about the various presets included in the system, none of which seemed to be an improvement on the basic calibration. Why even bother having presets if they’re never going to be used? Still, these are minor black marks on what is an almost faultless performance. Like all receivers, the STR-DN1060 is a big, black, decidedly unlovely box, heavy enough to put your back out when you lift it. But once you’ve got it installed, once it’s actually sitting below your TV, it looks…good. Not just good. It looks right. It looks like it’s supposed to be there. At a time when so much home theater equipment is ugly as sin, this receiver’s sleek style and shiny looks are a welcome break. It is a 7.2-channel receiver, with six HDMI inputs (five rear, one front) and two HDMI outs, a USB port, ethernet and optical connections. The receiver is fully setup for Bluetooth and Wi-Fi, and works with Dolby and DTS surround sound - although it lacks support for more advanced tech, like Dolby Atmos. That's the main difference between this receiver and its newer brother, the Sony STR-DN1080, which has full support for object-based surround sound (and is not much more expensive, at just under $600). You’ve got Airplay, Google Cast and Spotify Connect, and you can even set it up to play speakers in different rooms, with different controls for each. It supports full 4K and HDR viewing, making it a stellar budget option for anyone with a 4K TV (although this is certainly not a requirement for its use). There is also support for high resolution audio files like DSD – not a major selling point, as these are relatively uncommon, but still nice to have (we explain what DSD means here). There’s an FM radio, app control, and…look, if you expect a feature to be there, chances are it probably is. For the price, this receiver packs a truly staggering number of of gizmos and doodads into it, making it spectacular value for money. The front panel is, as we mentioned, beautifully made. The brushed metal panels and single long LCD display look fantastic, and even when you’re not using the well-designed remote, operation is a breeze. The receiver turns on with a satisfying clunk when you hit the power button, and most functions can be accessed from the line of buttons under the display. There are two knobs: a big volume knob, and a slightly smaller input selector, both of which work well. We almost preferred using the volume knob to changing it with the remote. Setup is easy. Once you’ve connected it to your speakers and your TV (and your console - we use a Playstation 4 for our media playback), you can hit the big Home button on the remote to access the main menu. Just like the front-end of the receiver itself, the design is fantastic. Everything is where you expect it to be, nothing is hidden away, and it’s all displayed in a big, easy-to-read font. Setting up the sound and selecting a speaker formation, which we’ll talk about in more detail below, was simplicity itself. And if we were purely to judge this receiver on design, it would be almost perfect. It blends effortlessly into your existing setup, and can be operated by just about anyone. It’s not quite a hundred percent (we weren’t convinced by Sony’s SoundPal app, which we found ourselves ignoring more often than not, and Bluetooth reception sometimes took a little coaxing to work) but it’s very close. The receiver packaging is hardly worth a mention. It’s a cardboard box with some polystyrene inserts inside. The two main accessories – the ones you’ll be spending the most time with – are the remote and microphone. The mic, which is used for room calibration, is a coin-sized little puck. Chances are you’ll use it once and then never again, but it gets the job done in a fairly unobtrusive fashion. The remote that comes with the receiver is surprisingly well-designed. There are plenty of models out there – like the otherwise impeccable Marantz SR7011 (full review here) – that have a remote clogged with pointless buttons. But the one that comes with the Sony receiver is reasonably stripped-down, making it easy to operate. The room calibration and overall sound quality of the Sony STR-DN1060 receiver is fantastic, and dialogue really comes through the mix. You get a very large feature set at a very good price. ​The remote control for the STR-DN1060 is satisfyingly easy-to-use. The bass of the STR-DN1060 occasionally gets lost in the mix. We weren’t wild about the presets that came with the A/V receiver, which we don’t think helped matters. ​There are newer and better models of receiver available. **Various versions of the surround codec in question - too many to list here, or it would break our table. See manufacturer sites for the full breakdown. ***All wattage ratings are for two channels driven, which is what manufacturers commonly list. If you’re running all channels, expect the wattage per channel to be a little lower! Despite the fact that the DN1060 is quite old now, we are going to restrain ourselves from doing too much comparison to much newer models (with one exception) as we don’t think that’s very fair. So our first stop on the comparison train is the 7.2-channel Onkyo TX-NR646. There aren’t enormous differences between the Onkyo and the Sony; the Onkyo is around $250 cheaper, at $300, and the remote is far inferior to that of the Sony receiver. There’s also limited support for Dolby Atmos, and DTS:X support only came about through an update. If you have a choice, and the cash to spare, definitely go for the Sony. But if neither of those things are true, then you will be fine with the Onkyo. Another cheap option: the $350 Denon AVR-S710W. But unlike the Sony and the Onkyo, this one has support for Dolby Atmos, meaning you can rig up height speakers and get a fantastic surround sound system. As such, it should be the first choice in this particular lineup if that’s what you want to do, and it doesn’t hurt that it comes with a ton of great features and unsurprisingly excellent sound. However, you can probably get the cheaper Onkyo if you aren’t interested in height speakers. You’ll spend the same amount for the Yamaha RX-V679 as you will for the Sony receiver ($550), only you’ll get much better sound. There’s still no Dolby Atmos, but the Sony just can’t compete with the beefier Yamaha. While it just edges the Yamaha in dialogue, the big Y has much more power in the low end, and much more detail throughout. You also get very decent room calibration. Ideally, this is the receiver you buy if you have a bigger room; if you have a smaller one, you’ll probably be okay with the Sony. Here is the exception we’re going to make when comparing the DN1060 to newer models: its bigger brother. The Sony STR-DN1080 is currently on our list of the best A/V receivers available, and with good reason. It keeps everything we liked about the previous version, including the excellent sound quality, and adds full Dolby Atmos support. It is also only slightly more expensive than the $550 DN1060, at $598. Honestly? You could probably buy this and be quite happy. 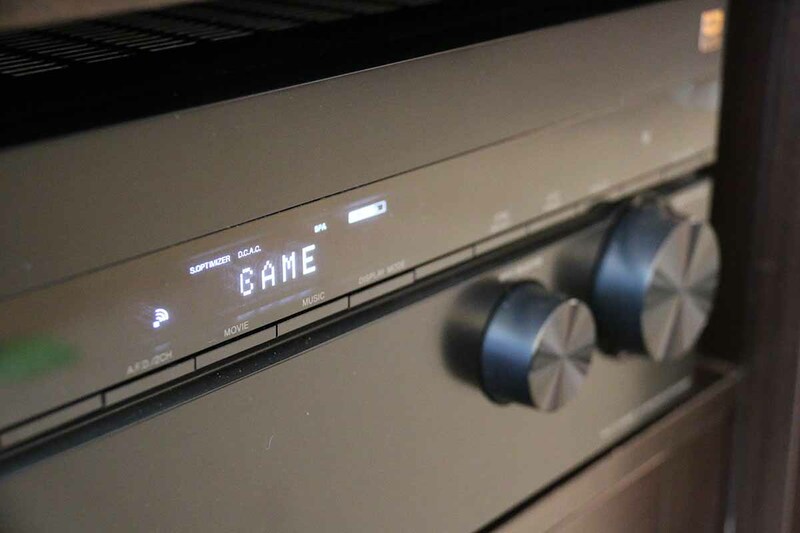 But if you don’t need Dolby Atmos, go with the older Sony.